View of Vauxhall station serving as the Grand Junction Railway's temporary Birmingham terminus in 1837. The drawing, which is full of detailed technical errors, shows just one platform that would have been used for both arrivals and departures. This was a common design feature in early railways (see images 'lnwrk160' and 'lnwrlave1374') as passenger traffic was not anticipated to be very demanding. In fact the first return train from Birmingham to Liverpool didn't occur until the 4th July 1837 In fact the first railways were built on the premis that the main revenue earning traffic was freight. It is believed that the bridge in the distance is Duddeston Mill Road. The fact that the artist did not know too much about railways can be seen by the fact that there are FIVE rails shared between two sets of tracks on the right. 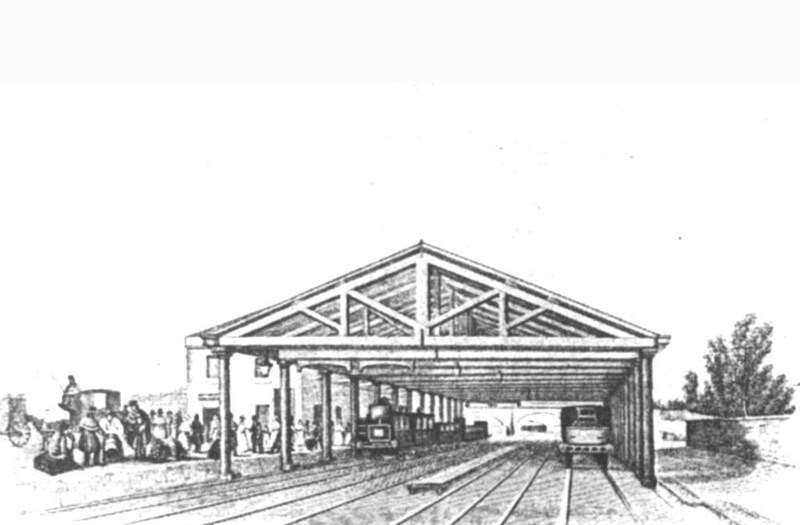 The platform in the centre of the four road shed was in all probability for railway staff rather than passengers being too narrow to accommodate the hustle and bustle of arriving or departing traffic.